Founded in 2003, Saroj Group was incepted in the Vision of developing and constructing Residential Apartment's and Commercial Complex's in and around Bengaluru. As the tag line "Live. 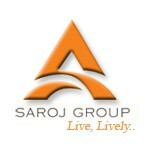 Lively.." indicates, Saroj Group believes in creating exceptionally unique homes with live neighbourhoods. With a Mission of providing finest Residential and Commercial Projects with excellent facilities in prime sectors, Saroj Group has constructed over 3,25,000 Sq Ft which includes of 173 Units of 7 Residential & 1 Commercial Projects as on March 2012. Saroj Group expands its way of excellent construction and service also by joining hands with other builders like Puruvankara Projects, SMR Builders, Sriven Homes, Indu Group, Gayatri Projects and many more top players in the market. On an average of 110% growth every year, Saroj Group started with Rs. 2 Cr turn over in 2003, has achieved Rs. 80 Cr turn over in 2011 - 2012. Founder & Managing Director of Saroj Group, Mr. Chakradhar Ch had the Vision of developing excellent quality homes with affordable price and most happening commercial spaces in the prime sectors of Bengaluru. An MBA graduate from CMRDA - Centre for Management Research and Development, Pune, Mr. Chakradhar considers the achievement of Saroj Group is certainly possible because of the excellent Team he has, who are dedicatedly joined with him for the growth of the company and themselves. His vision is to reach 200% growth in the upcoming year. Saroj Group has excellent, dedicated and visionary members in Management Team who are responsible for the growth and achievements in the past and in the future. Saroj Group has an outstanding and pivotal Technical Team consists of Engineers, Architects and Executives who helps surpass customer expectations continuously. Saroj Group Technical Team yields results based on Technical Know-How and Technical Know-Why. Uncompromising on any technical aspect, our Technical Team produces exceptional outcomes within specified technical boundaries.